Mastering the game of rummy requires a lot of skills. However, if you are smart in using some rummy strategies and skills, you will not only improve your game but also take home some real cash prizes. Even though most of the online rummy websites help you to improve your skills by providing practice tables and freerolls, most of the naive users can’t get skilled enough to play on cash tables or with the high rollers. To help you out in using the perfect rummy strategy both on free as well as cash tables, we have brought a list of tips and tricks you can learn how to play rummy card game to improvise your game and by that way, to win more. Once the 13 cards are dealt, sort them in order to make it easier to create melds. Even if you have more than one joker card, look out to make pure sequences first. Later on, you can use the extra jokers to complete your unfinished sets or sequences. One of the common mistakes made by the novice players is that they make sets before forming sequences. Always aim to make sequences first and then make sets after which you can easily declare the game for a win. High cards serve no value but only add extra burden of points. If you have high cards with no possibilities of forming sequences or sets, the best strategy in rummy would be to discard them right away. This will also help you to get penalized with less points if your opponents declare before you. Middle cards like 5 and 6 of any suit are more useful than any other cards in online rummy games. You have more chances of forming sequences with cards like 3, 4, 5, 6, 7 and 8, unlike high value cards that limit your options. But if you have a middle card as joker, avoid making melds surrounding that card because you will have less probability to completing it. It is very important for a rummy player to trace all the cards discarded by their opponents. Online rummy sites have Discards Sections that allow players to view all the discarded cards. If you follow the pattern of discarded cards, you will not discard any card that will be of any use to your opponents. Jokers are the most versatile cards in online rummy games. If you don’t use the right rummy strategies to play with Jokers, you may miss your chance to win the game. So, use improvised rummy strategies to play with Jokers so that you make the best of it. Just like Poker, you need not have to play every hand. If you find that you have no or less chances of winning the game, the best option would be to drop out of it. There is harm in accepting defeat as you will save yourself from losing a lot of points. 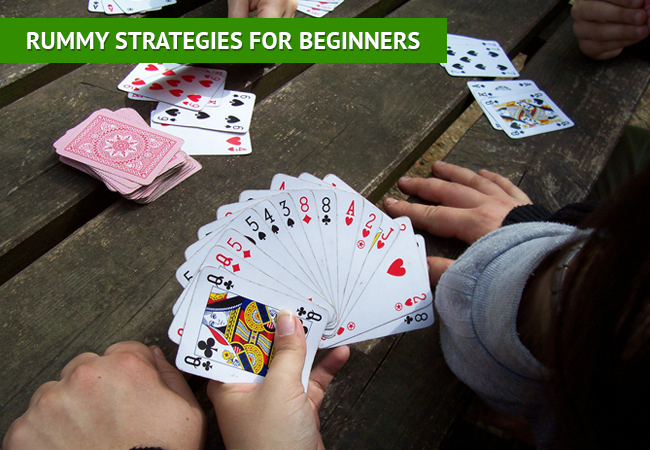 Use these rummy strategies while practicing online rummy games. After playing a few deals, you will experience the difference: you will end up winning more than what you did before. So, keep playing Indian rummy games and win big with these useful rummy tips and tricks.